We make the Best Friends wood sign. The wood sign is built in our workshop. There are options for the edges of the wood sign. They are both straight, both jagged, left straight and right jagged, and left jagged and right straight. The wood sign is hand painted. The color options are blue, light blue, green, yellow, and purple. The text color can be either white or black. 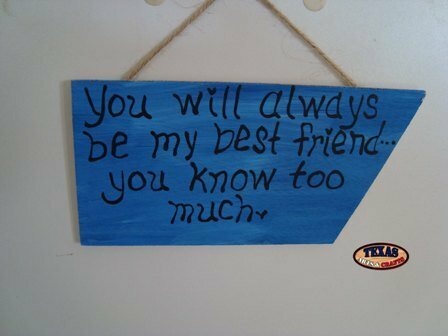 The sign reads You will always be my best friend... you know too much. 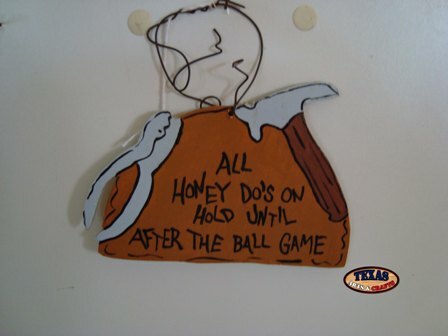 The dimensions for the funny sayings sign are approximately 4 inches tall by 8.50 inches wide by .25 inches deep. The funny sayings sign weighs approximately 1.25 pounds with packaging. For the continental U.S. shipping and handling is included in the listed price. For shipping outside the continental U.S. please contact us through our Contact Us page. We make the Cleaning House wood sign. The wood sign is built in our workshop. There are options for the edges of the wood sign. They are both straight, both jagged, left straight and right jagged, and left jagged and right straight. The wood sign is hand painted. The color options are blue, light blue, green, yellow, and purple. The text color can be either white or black. 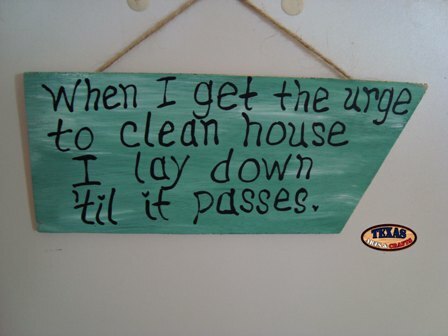 The sign reads When I get the urge to clean house I lay down 'til it passes. We make the Not Bossy wood sign. The wood sign is built in our workshop. There are options for the edges of the wood sign. They are both straight, both jagged, left straight and right jagged, and left jagged and right straight. The wood sign is hand painted. The color options are blue, light blue, green, yellow, and purple. The text color can be either white or black. 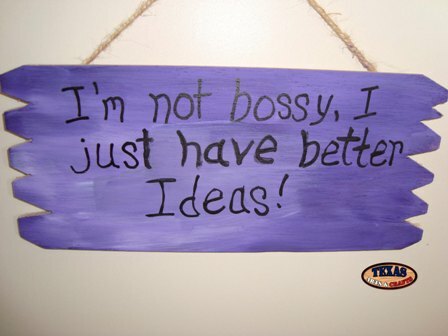 The sign reads I'm not bossy, I just have better ideas! We make the Nothing wood sign. The wood sign is built in our workshop. There are options for the edges of the wood sign. They are both straight, both jagged, left straight and right jagged, and left jagged and right straight. The wood sign is hand painted. The color options are blue, light blue, green, yellow, and purple. The text color can be either white or black. 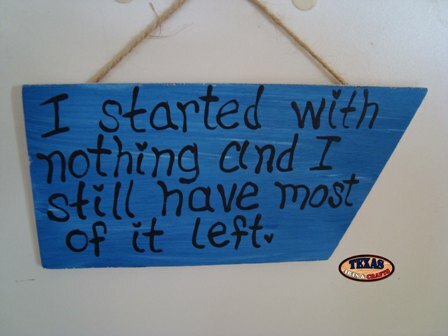 The sign reads I started with nothing and I still have most of it left. We make the Poor wood sign. The wood sign is built in our workshop. There are options for the edges of the wood sign. They are both straight, both jagged, left straight and right jagged, and left jagged and right straight. The wood sign is hand painted. The color options are blue, light blue, green, yellow, and purple. The text color can be either white or black. 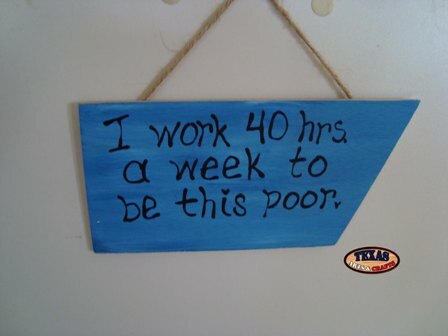 The sign reads I work 40 hours a week to be this poor. We make the Ship Comes In wood sign. The wood sign is built in our workshop. There are options for the edges of the wood sign. They are both straight, both jagged, left straight and right jagged, and left jagged and right straight. The wood sign is hand painted. The color options are blue, light blue, green, yellow, and purple. The text color can be either white or black. 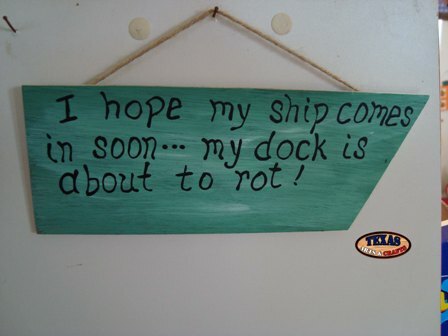 The sign reads I hope my ship comes in soon... my dock is about to rot! 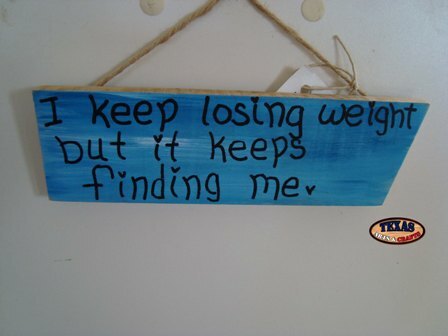 We make the Losing Weight wood sign. The wood sign is built in our workshop. There are options for the edges of the wood sign. They are both straight, both jagged, left straight and right jagged, and left jagged and right straight. The wood sign is hand painted. The color options are blue, light blue, green, yellow, and purple. The text color can be either white or black. The sign reads I keep losing weight but it keeps finding me. We make the Getting Older wood sign. The wood sign is built in our workshop. There are options for the edges of the wood sign. They are both straight, both jagged, left straight and right jagged, and left jagged and right straight. The wood sign is hand painted. The color options are blue, light blue, green, yellow, and purple. The text color can be either white or black. 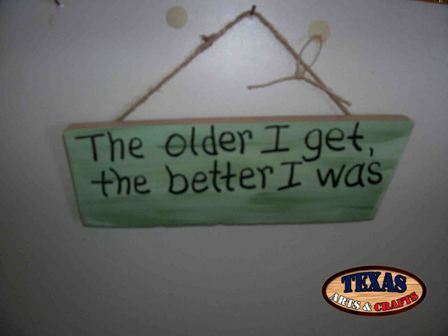 The sign reads The older I get, the better I was. We make the Be Patient wood sign. The wood sign is built in our workshop. There are options for the edges of the wood sign. They are both straight, both jagged, left straight and right jagged, and left jagged and right straight. The wood sign is hand painted. The color options are blue, light blue, green, yellow, and purple. The text color can be either white or black. 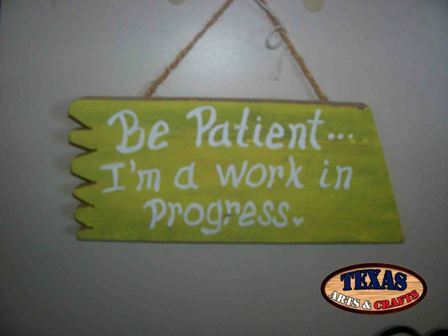 The sign reads Be patient... I'm a work in progress. We make the Fishing wood sign. The wood sign is built in our workshop. The sign is hand painted brown with green fish. 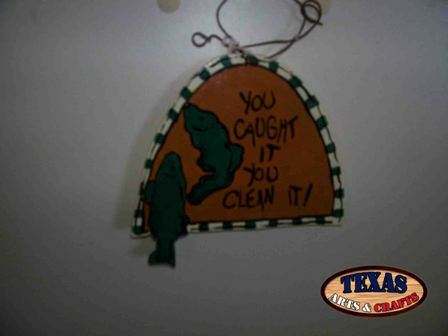 The sign reads You caught it you clean it! The dimensions for the funny sayings sign are approximately 5.50 inches tall by 5.50 inches wide by .25 inches deep. 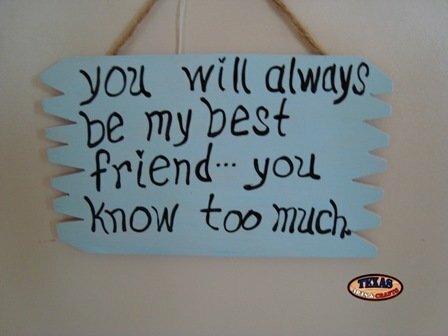 The funny sayings sign weighs approximately 1.25 pounds with packaging. For the continental U.S. shipping and handling is included in the listed price. For shipping outside the continental U.S. please contact us through our Contact Us page. The dimensions for the funny sayings sign are approximately 4.25 inches tall by 6 inches wide by .25 inches deep. The funny sayings sign weighs approximately 1.25 pounds with packaging. For the continental U.S. shipping and handling is included in the listed price. For shipping outside the continental U.S. please contact us through our Contact Us page. We make the Child Proofing wood sign. The wood sign is built in our workshop. There are options for the edges of the wood sign. They are both straight, both jagged, left straight and right jagged, and left jagged and right straight. The wood sign is hand painted. The color options are blue, light blue, green, yellow, and purple. The text color can be either white or black. 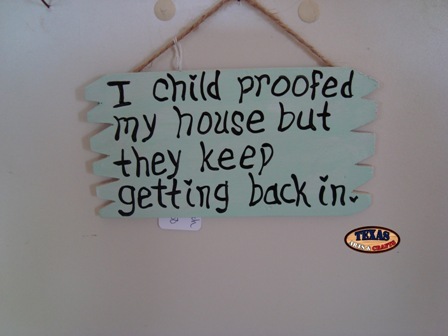 The sign reads I child proofed my house but they keep getting back in. We make the Farmer wood sign. The wood sign is built in our workshop. There are options for the edges of the wood sign. They are both straight, both jagged, left straight and right jagged, and left jagged and right straight. The wood sign is hand painted. The color options are blue, light blue, green, yellow, and purple. The text color can be either white or black. 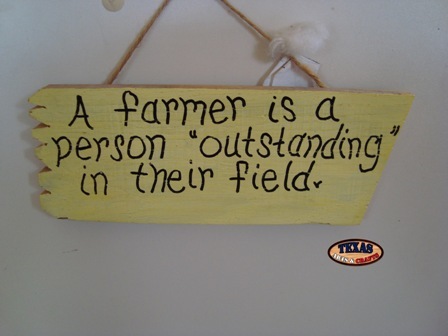 The sign reads A farmer is a person "outstanding" in their field. We make the Life Bugs wood sign. The wood sign is built in our workshop. There are options for the edges of the wood sign. They are both straight, both jagged, left straight and right jagged, and left jagged and right straight. The wood sign is hand painted. The color options are blue, light blue, green, yellow, and purple. The text color can be either white or black. 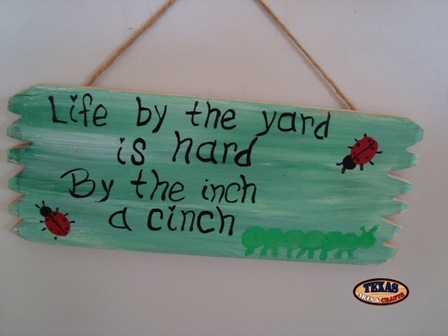 The sign reads Life by the yard is hard By the inch a cinch. We make the Life Passing Me By wood sign. The wood sign is built in our workshop. There are options for the edges of the wood sign. They are both straight, both jagged, left straight and right jagged, and left jagged and right straight. The wood sign is hand painted. The color options are blue, light blue, green, yellow, and purple. The text color can be either white or black. 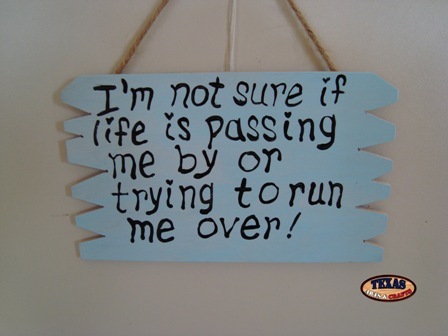 The sign reads I'm not sure if life is passing me by or trying to run me over! We make the Own little World wood sign. The wood sign is built in our workshop. There are options for the edges of the wood sign. They are both straight, both jagged, left straight and right jagged, and left jagged and right straight. The wood sign is hand painted. The color options are blue, light blue, green, yellow, and purple. The text color can be either white or black. 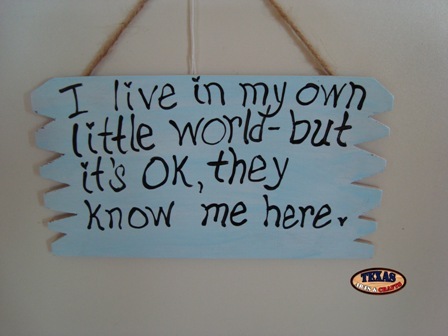 The sign reads I live in my own little world-but it's ok, they know me here. We make the Sisters wood sign. The wood sign is built in our workshop. There are options for the edges of the wood sign. They are both straight, both jagged, left straight and right jagged, and left jagged and right straight. The wood sign is hand painted. The color options are blue, light blue, green, yellow, and purple. The text color can be either white or black. 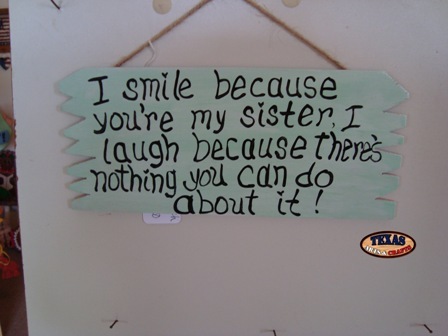 The sign reads I smile because you're my sister, I laugh because there's nothing you can do about it! We make the You Are What You Eat wood sign. The wood sign is built in our workshop. There are options for the edges of the wood sign. They are both straight, both jagged, left straight and right jagged, and left jagged and right straight. The wood sign is hand painted. The color options are blue, light blue, green, yellow, and purple. The text color can be either white or black. 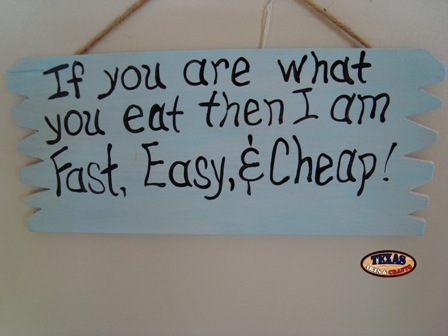 If you are what you eat then I'm Fast, Easy, & Cheap! We make the Exposure to the SON wood sign. The wood sign is built in our workshop. There are options for the edges of the wood sign. They are both straight, both jagged, left straight and right jagged, and left jagged and right straight. The wood sign is hand painted. The color options are blue, light blue, green, yellow, and purple. The text color can be either white or black. 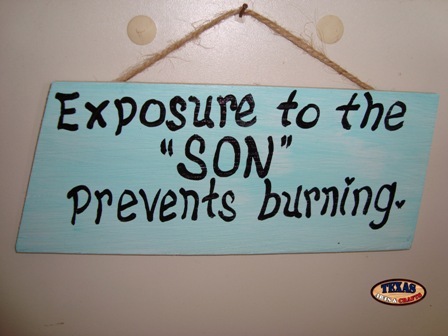 The sign reads Exposure to the "SON" prevents burning. We make the Get Rid of the Kids wood sign. The wood sign is built in our workshop. There are options for the edges of the wood sign. They are both straight, both jagged, left straight and right jagged, and left jagged and right straight. The wood sign is hand painted. The color options are blue, light blue, green, yellow, and purple. The text color can be either white or black. 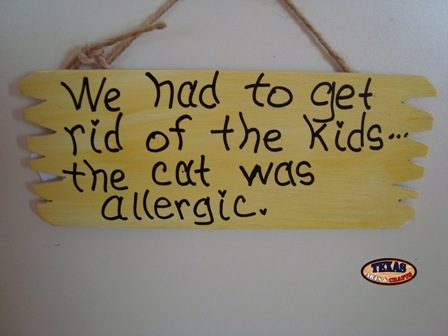 The sign reads "We Had to get rid of the kids...the cat was allergic." We make the Live Well wood sign. The wood sign is built in our workshop. There are options for the edges of the wood sign. They are both straight, both jagged, left straight and right jagged, and left jagged and right straight. The wood sign is hand painted. The color options are blue, light blue, green, light green, yellow, purple, and light purple. The text color can be either white or black. 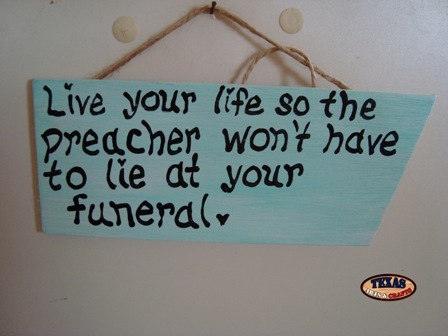 The sign reads "Live your life so the preacher won't have to lie at your funeral." We make the Love wood sign. The wood sign is built in our workshop. There are options for the edges of the wood sign. They are both straight, both jagged, left straight and right jagged, and left jagged and right straight. The wood sign is hand painted. The color options are blue, light blue, green, light green, yellow, purple, and light purple. The text color can be either white or black. 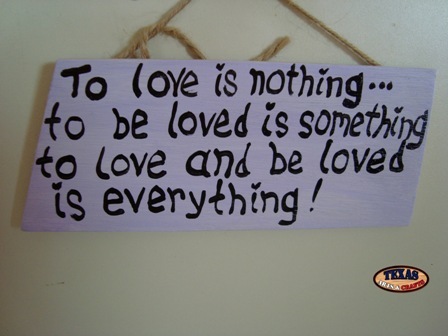 The sign reads "To love is nothing...to be loved is something to love and be loved is everything!" We make the Marriages wood sign. The wood sign is built in our workshop. There are options for the edges of the wood sign. They are both straight, both jagged, left straight and right jagged, and left jagged and right straight. The wood sign is hand painted. The color options are blue, light blue, green, light green, yellow, purple, and light purple. The text color can be either white or black. 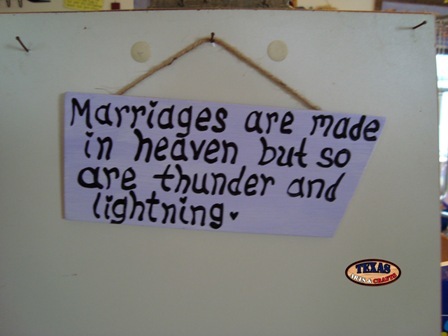 The sign reads "Marriages are made in heaven but so are thunder and lightning." We make the Men Are Like Fish wood sign. The wood sign is built in our workshop. There are options for the edges of the wood sign. They are both straight, both jagged, left straight and right jagged, and left jagged and right straight. The wood sign is hand painted. The color options are blue, light blue, green, light green, yellow, purple, and light purple. The text color can be either white or black. 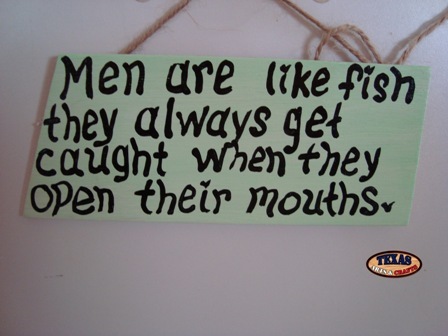 The sign reads "Men are like fish they always get caught when they open their mouths." 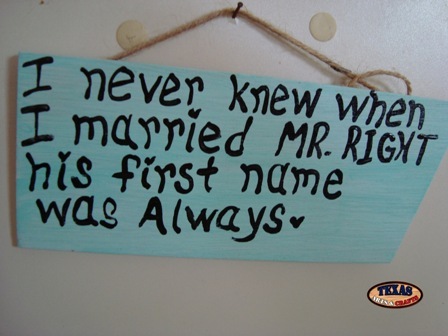 We make the Mr Always Right wood sign. The wood sign is built in our workshop. There are options for the edges of the wood sign. They are both straight, both jagged, left straight and right jagged, and left jagged and right straight. The wood sign is hand painted. The color options are blue, light blue, green, light green, yellow, purple, and light purple. The text color can be either white or black. The sign reads "I never knew when I married Mr. Right his first name was Always." We make the Pleasing People wood sign. The wood sign is built in our workshop. There are options for the edges of the wood sign. They are both straight, both jagged, left straight and right jagged, and left jagged and right straight. The wood sign is hand painted. The color options are blue, light blue, green, light green, yellow, purple, and light purple. The text color can be either white or black. 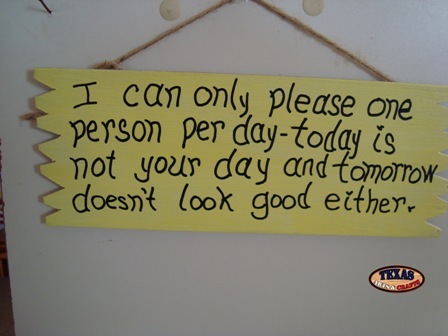 The sign reads "I can only please one person per day-today is not your day and tomorrow doesn't look good either." We make the Sharing Your Love wood sign. The wood sign is built in our workshop. There are options for the edges of the wood sign. They are both straight, both jagged, left straight and right jagged, and left jagged and right straight. The wood sign is hand painted. The color options are blue, light blue, green, light green, yellow, purple, and light purple. The text color can be either white or black. The sign reads "In all you dream and in all you do, may the love you share bring joy to you." We make the Strength From Love wood sign. The wood sign is built in our workshop. There are options for the edges of the wood sign. They are both straight, both jagged, left straight and right jagged, and left jagged and right straight. The wood sign is hand painted. The color options are blue, light blue, green, light green, yellow, purple, and light purple. The text color can be either white or black. 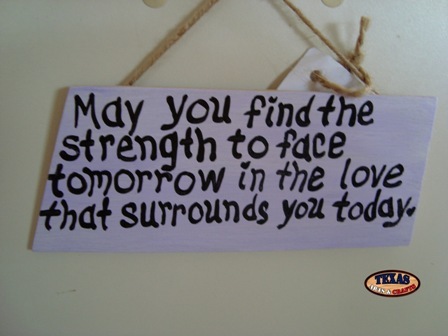 The sign reads "May you find the strength to face tomorrow in the love that surrounds you today." We make the Teachers Task wood sign. The wood sign is built in our workshop. There are options for the edges of the wood sign. They are both straight, both jagged, left straight and right jagged, and left jagged and right straight. The wood sign is hand painted. The color options are blue, light blue, green, light green, yellow, purple, light purple, and hot pink. The text color can be either white or black. 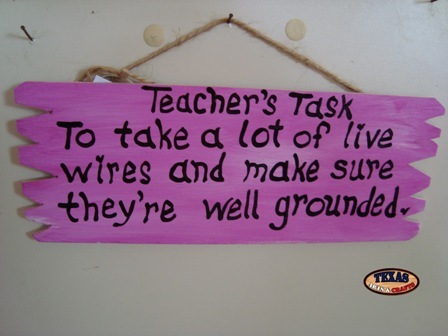 The sign reads "Teachers Task To take a lot of live wires and make sure they're well grounded." We make the Want What I Have wood sign. The wood sign is built in our workshop. There are options for the edges of the wood sign. They are both straight, both jagged, left straight and right jagged, and left jagged and right straight. The wood sign is hand painted. The color options are blue, light blue, green, light green, yellow, purple, and light purple. The text color can be either white or black. 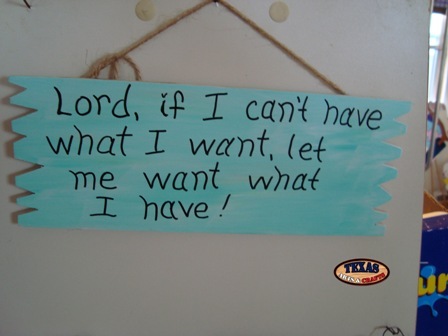 The sign reads "Lord, if I can't have what I want, let me want what I have!" 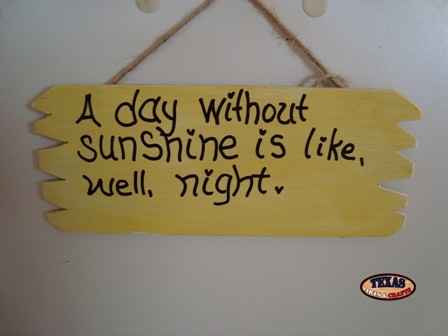 We make the Without Sunshine wood sign. The wood sign is built in our workshop. There are options for the edges of the wood sign. They are both straight, both jagged, left straight and right jagged, and left jagged and right straight. The wood sign is hand painted. The color options are blue, light blue, green, light green, yellow, purple, and light purple. The text color can be either white or black. The sign reads "A day without sunshine is like, well, night."